Burt Bacharach is one of the most accomplished popular composers of the 20th Century. In the ’60s and ’70s, he was a dominant figure in pop music, racking up a remarkable 52 Top 40 hits. In terms of style, Bacharach’s songs differed from much of the music of the era. Bacharach compositions typically boasted memorable melodies, unconventional and shifting time signatures, and atypical chords. Combining elements of jazz, pop, Brazilian music and rock, Bacharach created a unique new sound that embodied the time. Hal David, Bacharach’s primary collaborator, supplied Bacharach’s music with lyrics worthy of the best Tin Pan Alley composers. David’s unsentimental, bittersweet lyrics were often in striking contrast to Bacharach’s soaring melodies. While in the late 1970s Bacharach’s name became synonymous with elevator music (due in great part to its sheer familiarity), a closer listening suggests that his meticulously crafted, technically sophisticated compositions are anything but easy listening. Burt Freeman Bacharach was born in Kansas City, Mo., on May 12, 1928. The son of nationally syndicated columnist Bert Bacharach, Burt moved with his family in 1932 to Kew Gardens in Queens, New York. At his mother’s insistance, he studied cello, drums and then piano beginning at the age of 12. Burt hated taking piano lessons. His dream was to play professional football, but his size–or lack thereof–kept him out of that field. 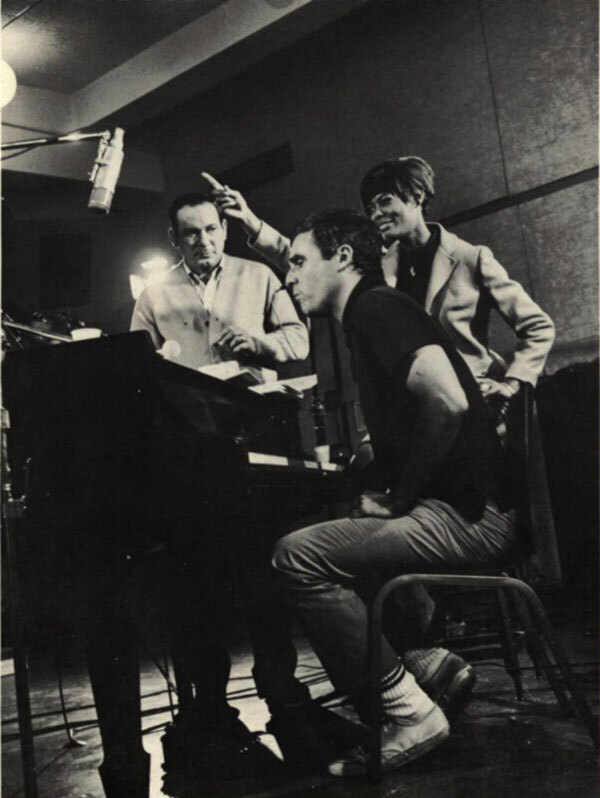 In 1957, Bacharach collaborated for the first time with lyricist Hal David (b. May 25, 1921), whom he had met while both worked at the Famous Paramount Music Company in New York’s legendary Brill Building. The pair struck gold almost immediately with hits for Marty Robbins (“The Story of My Life,” which reached No. 15 in 1957) and Perry Como (“Magic Moments,” which reached No. 8 in 1958), but their greatest success together wouldn’t begin until a few years later. Also in 1958, Burt also scored a novelty hit with “(Theme From) The Blob,” which reached No. 33. Bacharach worked extensively with the Drifters during this period, arranging horns and strings and writing (with Bob Hilliard) the group’s 1961 singles “Mexican Divorce” and “Please Stay.” It was at a Drifters session that Bacharach met Marie Dionne Warwick (born Dec. 12, 1940, in East Orange, N.J.), a member of backup vocal group the Gospelaires and niece of vocalist Cissy Houston. It soon becamse apparent that Warwick possess a remarkable ability to navigate even the most difficult of Bacharach’s melodies and tempos. She began cutting demo records for Bacharach & David, one of which was for “Make It Easy On Yourself.” Warwick mistakenly believed “Make It Easy On Yourself” would be her commercial debut, and when the songwriters revealed that the song had been given to Jerry Butler, she angrily shot back, “Don’t make me over, man!” (slang for don’t lie to me). Warwick’s angry response became the seed of her first Top 40 hit, 1962’s “Don’t Make Me Over,” which reached No. 21. Bacharach & David went on to write and produce 20 Top 40 hits for Warwick over the next 10 years, seven of which went Top Ten: “Anyone Who Had a Heart” (1963), “Walk On By” (1964), “Message to Michael” (1966), “I Say a Little Prayer” (1967), “Do You Know the Way to San Jose” (1968), “This Girl’s in Love with You” (1969) and “I’ll Never Fall in Love Again” (1969). 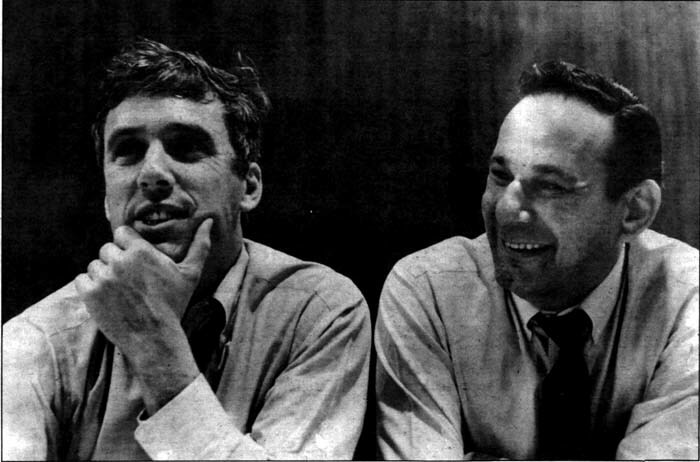 Besides their work writing and producing albums for Warwick, the team of Bacharach & David was also responsible for hits with other performers, including Jackie DeShannon (“What the World Needs Now”), the Fifth Dimension (“One Less Bell to Answer”), Manfred Mann (“My Little Red Book”), Bobby Vinton (“Blue on Blue”), Herb Alpert (“This Guy’s in Love With You”), Tom Jones (“What’s New, Pussycat?” “Promise Her Anything”), Jack Jones (“Wives and Lovers”), Dusty Springfield (“The Look of Love”) and B.J. Thomas (“Raindrops Keep Fallin’ On My Head”). 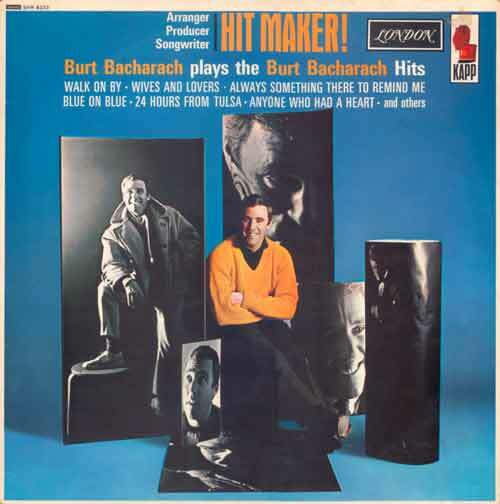 Other performers covered Bacharach composition to chart-topping effect, including the Walker Brothers (whose version of “Make It Easy on Yourself” hit No. 16 in 1965), the Carpenters (whose version of “[They Long to Be] Close to You” hit No. 1 in 1970), and Sergio Mendes & Brasil 66 (whose version of “The Look of Love” hit No. 4 in 1968). Through his wife, screen star Angie Dickinson (whom he married in 1966 and divorced in 1980), Bacharach moved into film scores. His credits include the tile song to Alfie, a hit for Cilla Black and Dionne Warwick, and film scores for What’s New, Pussycat?, (its title song was a Top 5 hit for Tom Jones in 1965), After The Fox, Casino Royale (which introduced “The Look of Love”) and Butch Cassidy and the Sundance Kid, which spawned the No. 1 hit “Raindrops Keep Falling on My Head” and earned Bacharach a pair of Oscars (Best Score and Best Theme Song) as well as a Grammy for best score. A less-well-known theatrical project of Bacharach & David is the television musical On the Flip Side (1966), which starred Rick Nelson as a pop star whose luster had faded. In 1968, producer David Marrick recruited Bacharach & David to work with playwright Neil Simon on a musical version of the 1960 Billy Wilder film The Apartment. The result was the Broadway musical Promises, Promises, which ran for three years and 1,281 performances and won two Tonys and a Grammy for best cast recording. which Bacharach also scored. 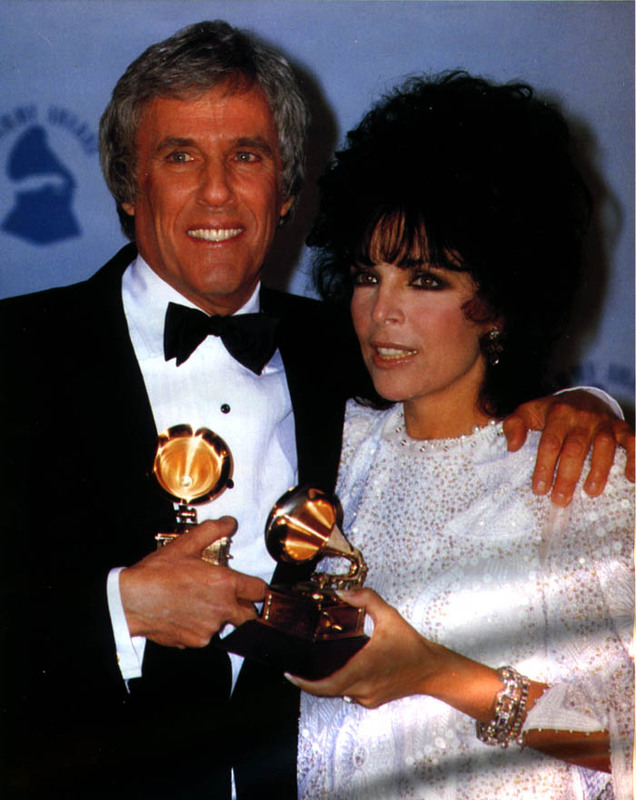 “Arthur’s Theme” earned Bacharach his third Oscar and also united him professionally with lyricist Carol Bayer Sager. The partnership would prove fruitful. Bacharach and Sager, who married in 1982 (Sager gave birth to their only child, Cristopher, in 1986), collaborated on hits for Sager (“Stronger Than Before,” 1981), Roberta Flack (“Making Love,” 1982), Dionne Warwick and Friends (“That’s What Friends Are For,” 1985), Patty Labelle and Michael McDonald (“On My Own,” 1986), and Dionne Warwick and Jeffrey Osborne (“Love Power,” 1987) among others. “Arthur’s Theme,” “That’s What Friends Are For” and “On My Own” each were No. 1 hits. Bacharach also scored a major hit around this time with a collaboration with Neil Diamond (“Heartlight” hit No. 5 in 1982), and British synth pop group Naked Eyes put an old Bacharach song back on the charts with their cover of “(There’s) Always Something There To Remind Me,” which reached No. 8 in 1983. In 1982, Bacharach composed the music for Ron Howard’sNight Shift, which first introduced “That’s What Friends Are For” (performed on the soundtrack by Rod Stewart), and, in 1988, the music for the sequel to Arthur, Arthur 2: On the Rocks. Bacharach has been involved in thoroughbred racing as an owner and breeder for more than 30 years, and his horses have competed in some of the sport’s most prestigious events. Burt’s Heartlight No. One, a three-year old filly named for his hit collaboration with Neil Diamond, was a thoroughbred champion in 1983, and Soul of the Matter was a Breeder’s Cup starter in 1994 and 1995. In January 1996, Burt was the subject of a BBC documentary, Burt Bacharach–This Is Now, which was later broadcast in America on “Great Performances.” For an appearance in London at the Royal Festival Hall in June 1996, Oasis’ Noel Gallagher joined Burt onstage to croon “This Guy’s In Love With You.” (A photograph of Bacharach appears on the cover of the band’s 1994 record Definitely Maybe). On Dec. 31, 1996, Burt and Dionne Warwick performed a special concert, “Live from the Rainbow Room,” which was broadcast on the American Move Classics cable television network. In 2002, Bacharach appeared for the third time in an Austin Powers movie, turning up as the credits rolled on “Austin Powers in Goldmember” (which also included a rendition of “Alfie”–recast as “Austin”–sung by Susanna Hoffs). Burt also reportedly began a collaboration with rapper Dr. Dre, composing melodies over drum loops supplied to him by Dre. In November 2005, Bacharach released At This Time, the first solo album to be released under Bacharach’s name in 26 years. The record included musical contributions from Dr. Dre, Chris Botti, Elvis Costello and Rufus Wainwright, but it gained even greater notoriety for its lyrics: It was the first record to feature lyrics written by Bacharach. Those lyrics — mostly written in collaboration with Tonio K. — explored political and social themes not typically associated with Bacharach’s music and led some to call it his most political record. The controversy didn’t affect members of the Recording Academy, which in February 2006 awarded At This Time the Grammy for Best Pop Instrumental Album. Bacharach was also nominated in the Best Pop Instrumental Performance category for the track “In Our Time,” a collaboration with Chris Botti. In 2012, Bacharach and Hal David received the Library of Congress Gershwin Prize in honor of their lifetime achievements in popular music. Burt’s official press kit bio is available here.